Ranchi, Jharkhand, India: CMC has bagged ‘Best Vocational training Company Serving Social Cause- CSR’ award from Associated Chambers of Commerce and Industry of India (Assocham) for “English Intervention Program” which is an in-school supplemental learning program for students from classes UKG to 10th providing courses on Spoken & Written English skills. Ms. Maya Swaminathan Sinha, Founder & Director, Clear Maze Consulting Pvt. Ltd. & CMC Skills Pvt. Ltd. said: “We’re extremely happy to receive this award from Assocham. 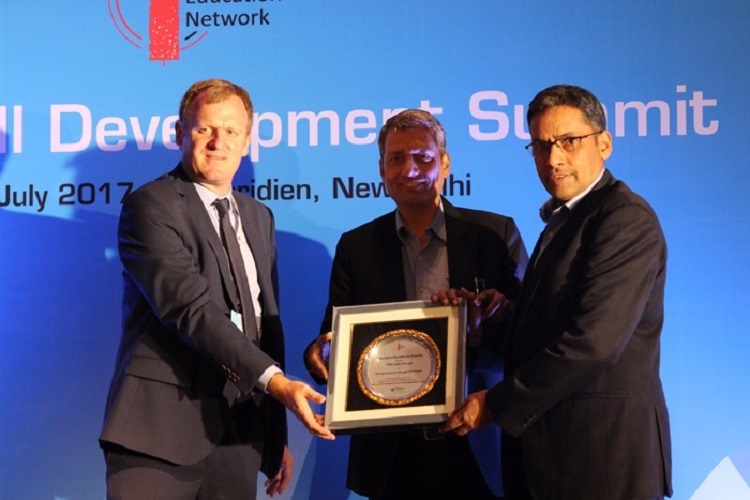 Shailesh Shahi, General Manager, CMC, received the award from Shri C P Singh, Minister of Urban Development, Housing & Transport Department, Govt. Of Jharkhand at the ASSOCHAM National Summit on Skilling India — The Way Forward on 31st July 2017. Expert panellists in different sessions were including ASSOCHAM Ranchi Regional Office Director SK Singh, Jharkhand Skill Development Mission Society (JSDMS) Mission Director Ravi Ranjan, Central Tasar Research and Training Institute (Ranchi Centre) Director Ajit Kumar Sinha, Amity University (Ranchi) Vice Chancellor Raman Kumar Jha, ICA Edu Skills Pvt Ltd MD Narendra Kumar Shyamsukha, Ranchi University ex-VC LN Bhagat, JSDMS ex-MD RP Singh, Veer Kunwar Singh University (Arah) ex-VC SP Singh. Recently, CMC Skills Pvt. Ltd. had also won awards for “Skill development through PPP model” by Indian education Network. Mr Atul Jaiswal, President – CMC Skills received the award in an Awards Ceremony organised on 21th July 2017 at Hotel Le-meridian, New Delhi. CMC has bagged 'Best Vocational training Company Serving Social Cause- CSR' award from Associated Chambers of Commerce and Industry of India (Assocham) for "English Intervention Program" which is an in-school supplemental learning program for students from classes UKG to 10th providing courses on Spoken & Written English skills.